My former roommate should certainly give Blanton’s a closer look. During prohibition, Blanton’s distillery was one of four distilleries given special permission by the federal government to continue manufacturing their bourbon. Other notables include: Basil Haydens, 8 yr; W.L. Weller, 19 yr. The Weller is superb, but it will be difficult to find. I imagine especially difficult to find in the U.K.
Me and Blanton’s have some history, with a bottle of it having already passed through my hands a few years back when I started getting into whisky, and it popping up in the interesting bars that I’ve been trying to find recently – it’s on my “try” list whenever I see it. If you like the Van Winkle 15, then you’d probably like all of the Van Winkles. The 20 yr is definitely the best on my list, but it will set you back about $130-$150 (USD) for a bottle. They have a 23 yr, and I hear it is even better. But, that one will set you back $300+. Some people don’t like the Old Pogue, because it has too much Rye. Generally, I keep around a Basil Haydens and/or a bottle of Blanton’s Single Barrel Original. The Eagle Rare-17 and the Pappy Van Winkle-20 are a nice treat, when I am feeling wealthy. I tried some Eagle Rare last night, and it was predictably very nice. It’s not particularly difficult to find over here, if you know where you’re looking, and we are getting much better imports of US whiskey into the specialist shops these days. 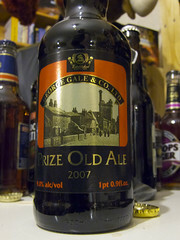 I rather like rye, so I’ll definitely keep an eye out for Old Pogue. However, I shall see what the whiskey mule (hello whiskey mule if you are reading) brings over. I actually found one bottle of the Weller yesterday at my local beverage shop. It is a rare find, so I suspected that it was in some way discontinued. Instead of getting the Weller, I opted for a small batch whiskey called Noah’s Mill. I hear it has “a rye edge.” It is a dark copper-brown, which generally means the bourbon has an above average rye in its mixture. I’ve never tried it. I promised that I’d save it to celebrate my Ph.D. final defense in late June. This is possibly another that the mule would have to bring to you, because I’m told it is a fairly local distribution.